More than ten players of the famous hockey team visited our hospital this afternoon. Saku Koivu, Sheldon Souray, Mark Streit, David Aebischer, Craig Rivet and many others gave out gifts and autographs to their little (and not so little) fans. 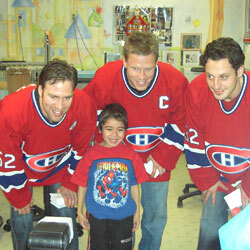 Thank you to the Montreal Canadians for putting smiles on our patients faces!